Today I'm sharing a Christian Historical Fiction novel I recently read for a book club on Goodreads. It made my 5-star rating, which is hard to do, as I can be picky with my Christian literature. So I thought I would share why I loved it so much. 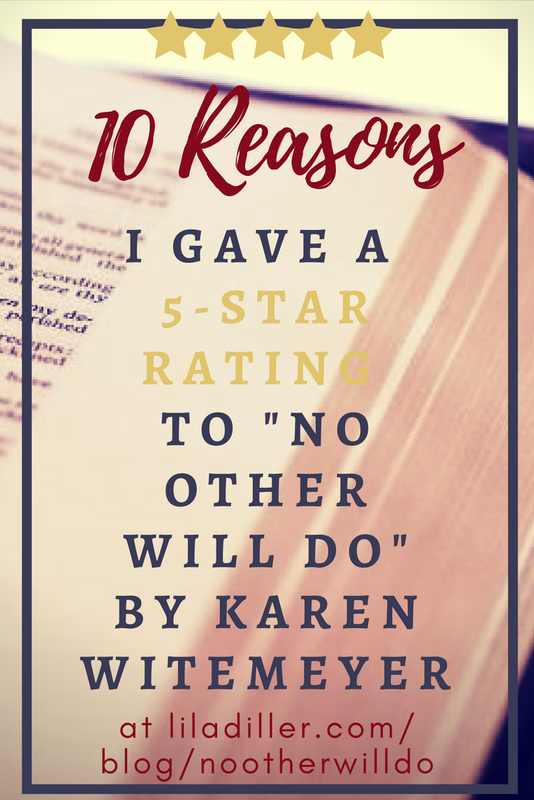 Karen Witemeyer wrote a truly delightful book called No Other Will Do, the first in the Ladies of Harper's Station series. With realistic characters, on-the-edge-of-my-seat plot, and accurate historical setting in the Old West, this earned by 5-star rating. 1. How did you feel about the setting? As a historical fiction, the details seemed to be well-researched and accurate, which is important to me. I didn't find any discrepancies in the setting of the Old West when horses were the primary means of travel, railroads were being built, and lawmen were scarce. 2. What do potential readers need to know most about the main character? The main characters, Emma and Malachi, are realistic and engaging right from the beginning. I wish I had known that the Prologue was written from Malachi's view but that the POV switches periodically from Malachi to Emma. It's always well-done and obvious, except for the first chapter. 3. Which supporting character caught your interest the most? The supporting characters were well-written, also. The assortment of personalities living in the women's colony was intriguing, from the independent, blustering Aunt Henry and Betty the chicken lady to the man-shy, timid Helen to the kind and wise Tori. For example, on page 264, Malachi shares his cookies with his horse. "The spices danced across his tongue, and the sweetness made him smile. The flavor reminded him of the ladies who had made them--spice for Henry with her opinionated nature, and sweet for Bertie, the nurturer. The two made a perfect blend." Wonderful cast. I hope they make this into a movie. 4. What journeys do the main characters take? Emma turns from needing no one to relying on Malachi. Malachi turns from surviving to belonging. 5. How is the writing style or quality of the writing? The writing was excellent! Very well edited, very engaging scenes, very little description—only what was needed to understand the characters and the society of the women's colony. “Tell me what I did, Em. Tell me what I did to hurt you, and I swear I'll put it to rights.” Somehow. “Oo it ur ob,” she mumbled into his chest. Well, that was less than helpful. I couldn't help it, I cackled out loud, making my husband look at me askance like I was going crazy. The social faux pas we readers sometimes make are so worth a good laugh, though, right? 7. (for Christian fiction) Are there spiritual truths to be gleaned from the story? Absolutely! Both Emma and Malachi had to learn to trust in God, even when they didn't know what the next step would be. Malachi learned to put people first. There were also several personal prayers, which I personally appreciate, as it shows the individual relationships we each to get to have with the Creator of the Universe. 8. For whom would you recommend this book? For anyone who loves Christian historical fiction, especially the Old West time, but it's also for anyone looking for a strong female lead without being feminist. While at first I thought that the women were being too hard on males in general, by the end they realized that some men are kind and good and that not all women are good; every person should be judged on their own merits. 9. Who will not like this book? I'm not sure who wouldn't enjoy this. Maybe if you don't like “overtly Christian” stories or historical fiction at all. 10. Why did you give it the star rating you did? Except for the POV switch from the Prologue to Chapter 1, I can't think of any other thing I would change or improve. That makes it a 5-star book in my rating system.